This Adventure School Trip through Namibia presents the students with an opportunity to view its stunning landscapes and natural wonders. On this program, the scene opens in Windhoek, with its mix of historical architecture and modern buildings. Leaving this behind, students then journey through the country, experiencing giant granite domes and rocky landscapes, the Sesriem Canyon as they explore it on foot, the marvelous sand dunes of the Namib Desert and the breathtaking phenomenon where the desert meets the ocean in Swakopmund. Situated in the north-western area of Namibia is Etosha National Park where vegetation ranges from dense vegetation to open areas which host a variety of wildlife. No doubt the game viewing experience here is something to look forward to. Adrenalin activities are not in short supply throughout the program – making for an exhilarating experience. From Windhoek the next stop is Sesriem Campsite in Sossulsvlei. In Swakopmund students are accommodated at Dunedin Star Guest House before moving on to Spitzkoppe Rest Camp. There will be more camping in Etosha National Park before the group returns to Windhoek for their final night. This internationally recognised facility is well known for it’s contributions to dryland research. 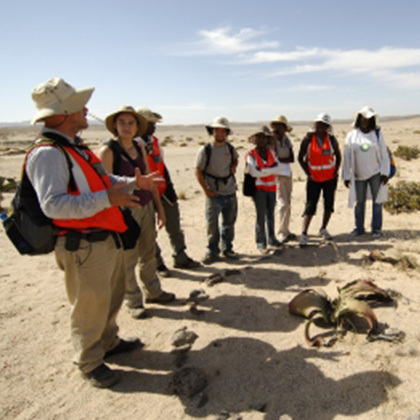 Besides it’s identity as a powerhouse for desert research, the Gobabeb Centre strives to impart awareness about environmental challenges and conservation projects through comprehensive training programs. These programs are offered to individuals from many walks of life, from international students to local farmers.